There are SO many ways to communicate visually, and internet is full of handy tools that anyone can learn to use. 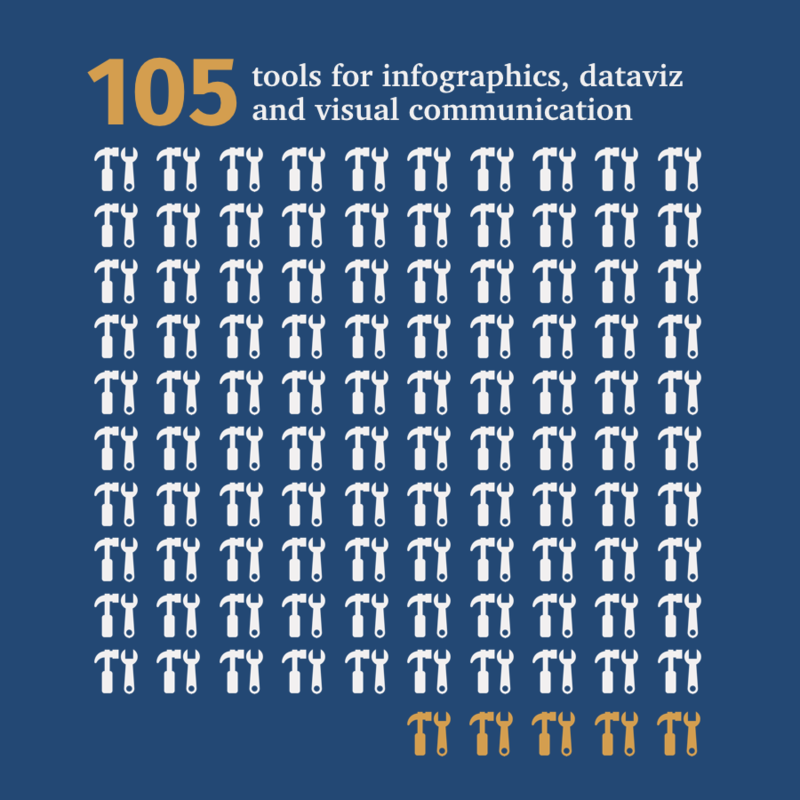 Here’s 105 tools for infographics, data visualisation and to all sorts of visual communication. This resource was put together in Finnish Facebook-group “Tiedon visualisointi” (meaning ”Visualising Knowlegde”). The collection is not perfect – and it doesn’t even include all the “obvious” great tools like Illustrator or Excel – but I find it helpful and use it a lot. Many of the tools are free, but for some you need to pay a bit. If you have any comments, or if you just want to say hello, I’d be happy to hear from you in Twitter or Linkedin. I hope you enjoy the toolkit as much as I do! Circular planning tool for an overall view of the annual activities. Annual Plan App for teams and companies. Explore and create color combinations & palettes. Community where people from around the world create and share colors and palettes. Tool for creating data visualisation palettes. Pull out colors from your picture, from a piece of art or browse for inspiration. Google AI experiment. A graphical user interface (GUI) for viewing, manipulating, and choosing HCL color palettes. Finnish startup with dataviz solutions. Powerful, simple to use, and free. The missing link between spreadsheets and data visualisation. The world’s first code-free sparkline typeface. Visualise and share your data in minutes. Lets you create visualisations, dashboards and apps. 50+ types of diagrams with features to help you draw faster and better. More than 4,000 customisable diagrams. A desktop app for creating sketches of problems, processes, workflows or ideas. Great-looking charts and business graphics. Free vector design app right at your fingertips. Free and open source vector graphics editor. Easy cube-based 3D design with DIY 2D/3D printing. Applies symmetries to everything you draw. Screen, webcam and sketchboard recorder with an editor. Nice community site for creatives, with occasional freebies. Find the right visualisation and get inspired how to make them. Turns your spreadsheet data into maps. combine your maps with narrative text, images, and multimedia. Not only for mind maps, but team sketching as well. Finnish startup. Ready-to-use design assets from 27,214 independent creators. Library of easy-to-edit PowerPoint slides. You can use the photos as you want as long as you do not download pictures to other photo stocks for free, or for sale. Open-source visual storytelling environment for presenting timelines in the browser or in Microsoft Power BI. Web-based software for creating interactive timelines that you can share on the internet. Presentations for the classroom in a unique timeline format. App to create videos on iPhone and iPad. Easy videos for social media. Animated videos for social media. App to get you into stop motion moviemaking. Nice feedback-tool that creates word clouds from the participants answers. Online word cloud art creator.